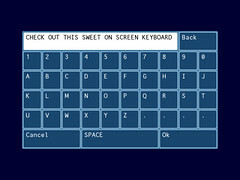 The new version features a few additional keys on the keyboard (including the long request question mark) and may or may not have partial USB keyboard support (USB keyboards don’t seem to be working with any homebrew for me so I can’t really test it until I figure out what that’s about). The maximum length for a post has been slightly increased. It automatically refreshes once every 15 seconds (as long as you are scrolled down to the bottom and the cursor is off screen). It looks different and you can randomize the color scheme at any time by pressing 2 or reset it by pressing 1. If there is demand for it I’ll setup a proper color selection menu and have the color scheme saved and loaded. The frame rate has improved. Since I finally updated the libraries I’m using there shouldn’t be any more problems with new Wiimotes and I’m sure there are probably other obscure bugs I’m not aware of that have been corrected. Wii Chatter’s keyboard defaults to lowercase and has a caps lock button. Avoidance and Hero City 2 (the nightmare mode) both have added leaderboards that work just like Cherophobe’s does. Winter’s End is a bit more efficient (not that it makes any difference). All of them have a new home menu. I rewrote a lot of it and added and changed a lot in the process. 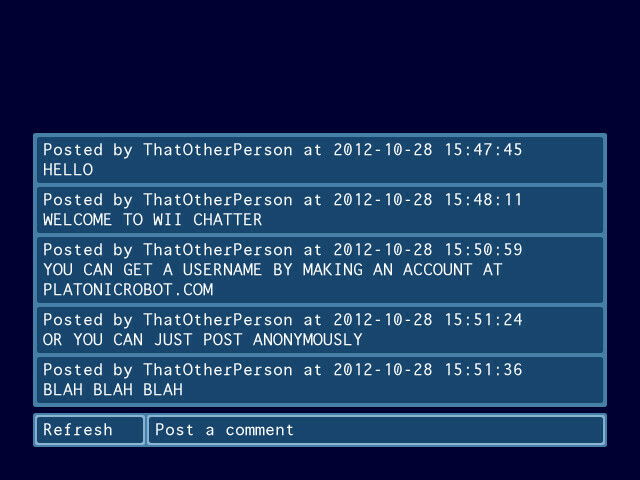 The network browser thing has a built in on screen keyboard (just like the one in Wii Chatter). So now you can use it to post things on people’s user pages and in the future you will be able to send private messages and even register an account without needing to actually visit the site. There is also a little news window next to the main home menu. So you will be able to find out if you are using an outdated version or if something cool has happened without needing to go to the network section of the home menu. The new sprite sheet / texture it uses is half the size it was previously (which was already smaller than it was not too long ago) so that’s good for technical reasons. The buttons and things are designed in a way that allows me to put them closer together and thus fit more on screen. I’ve even got it setup so I can use different colors of text. I’m not crazy about the way it all actually looks though. I’ll probably change the color pallet later and maybe make it customizable. 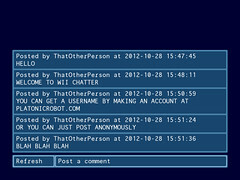 Wii Chatter is a chat room program. You post text and people can read it. The onscreen keyboard can’t yet switch between uppercase and lowercase yet so it’s going to seem like everyone is screaming for a little while. Fixing that is pretty high up on my to do list. If it really bothers anyone I can make changes on the server side to make everything lowercase well you wait for the next version. 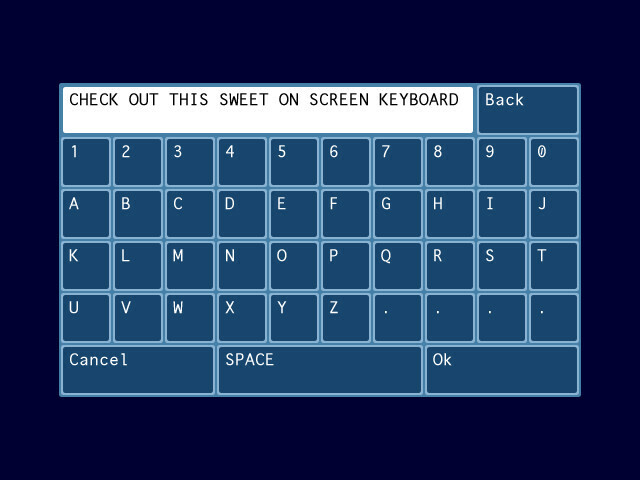 Do you think a QWERTY layout would be better? I’d like to also add support for USB keyboards. Hopefully it will get into the homebrew browser sometime soon. It’s been over a month since the last batch of games/updates were added. I’m thinking about making a homebrew browser alternative and/or making my games self updating. It seems like there is still a reasonable (though certainly declining) number of people playing Wii homebrew but only a small minority of people visit dev sites like this or even general homebrew news sites to get the latest versions of brew. I’m probably going to replace the home menu / dashboard UI I use in all my stuff with not blue versions of the UI elements I made for this. Because of reasons. Any objections?